better life style than you might think! So most tourists driving up the Stuart Highway will spend a night here anyway. Do yourself a favour and make that two! Coober Pedy is called - no, Coober Pedy is - the opal capital of the world. It's not the only opal mining town in Australia, but it is by far the biggest and produces more opal than any other place in the world. You know you are getting closer to Coober Pedy when the South Australian Outback left and right of the Stuart Highway turns totally flat, barren and featureless. Mullock heaps (the waste excavated from opal mines) dot the landscape, opal mining machinery is silhouetted against the horizon, and dust clouds indicate active diggings. Then you get to the town itself, and it looks, well, exactly the same. Mounds of mullock everywhere, and not much else. But only at first glance! Coober Pedy's population hovers around 4000 - give or take a few thousand, depending on the time and size of the last notable opal find. 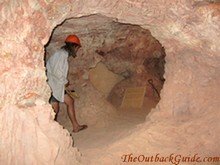 But you wouldn't guess it when you first look at the place, because most of the people in Coober Pedy live underground. The name Coober Pedy developed from the Aboriginal "kupa piti", meaning "white man's hole in the ground" or "white man in a hole". If living underground sounds horrible, as in dark, damp and cramped, think again. These homes with their rose coloured sandstone walls are gorgeous. If I had a nice hill, of the same sandstone that they get here, on my own block at home, I'd start digging today. 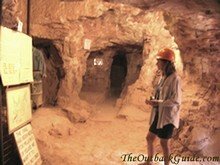 Have a look at the page about Coober Pedy underground homes and you will see what I mean. 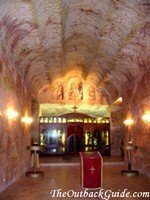 Spend some time in Coober Pedy and you will definitely see what I mean. Underground homes are the best idea ever! Everything here is underground: lots of the shops, the hotels, motels and backpackers, a swimming pool, the churches, there is even underground camping. The golf course, consisting of sand, gravel and oil slicks, is above ground. They don't have water in this town, but they do have a sense of humour. Coober Pedy life revolves around opals (and tourism). You can visit dozens of stores here, and you can also explore some of the mines. There's quite a selection of old mine shafts to wander through, as well as guided tours through active mines. The self guided tour in the Old Timers Mine is my favourite. But for some reason they never returned. The hidden shafts and the opal still waiting in the walls were accidentally discovered during the excavations for a home extension. The owners decided not to recover and sell the opal (some of the pieces visible are easily worth tens of thousands of dollars). It's still there in the wall. It's a fun and informative tour and also includes a museum part and some underground homes. You can even find out what is required to stake a claim and to start opal mining yourself. Another good place to learn about opal mining, both in the old days and today, is the display in the Desert Cave Hotel. 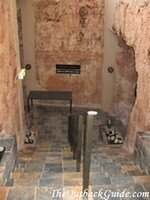 The Desert Cave Hotel is the flashiest accommodation in Coober Pedy (underground, of course), but their doors are open to all. Visitors are welcome to stroll through and the display is really excellent. If you have travelled in the Australian Outback before, then you know that once you leave the populated areas you are restricted to a somewhat monotonous fare: steaks, bacon and egg sandwiches, burgers, fries and pies, accompanied by two limp lettuce leaves and a sad, pink slice of cardboard, pretending to be a tomato. But the food at the clubs and restaurants in Coober Pedy is fantastic! The reason is that Coober Pedy's population is so multicultural. You will soon note that the Australian accent is the exception. 45 nationalities are represented here, making Coober Pedy one of the most ethnically diverse communties in Australia. Anyway, before you leave for good make sure you have a look at the Breakaways! You may even want to consider a bigger loop, taking in Oodnadatta and the Painted Desert.